In 2014, the Chicago Police Department reported 2500 shootings reported in Chicago through Dec. 13, 2014, a 13 percent increase from its 2013 numbers. While homicides decreased to the lowest numbers since 1965 shootings continue to grow and menace our most vulnerable youth living in our most challenged low-income communities of color. 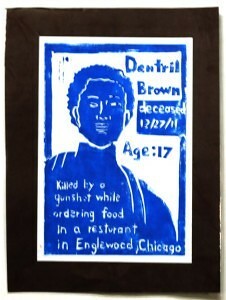 In the midst of this ongoing violence, ThinkArt in partnership with The Arts Palette and Josef Glimer Gallery will present Uplift Community High School student artists’ series of mosaic linoleum relief prints that represent the spirits of youth claimed to senseless violence on the streets of Chicago. 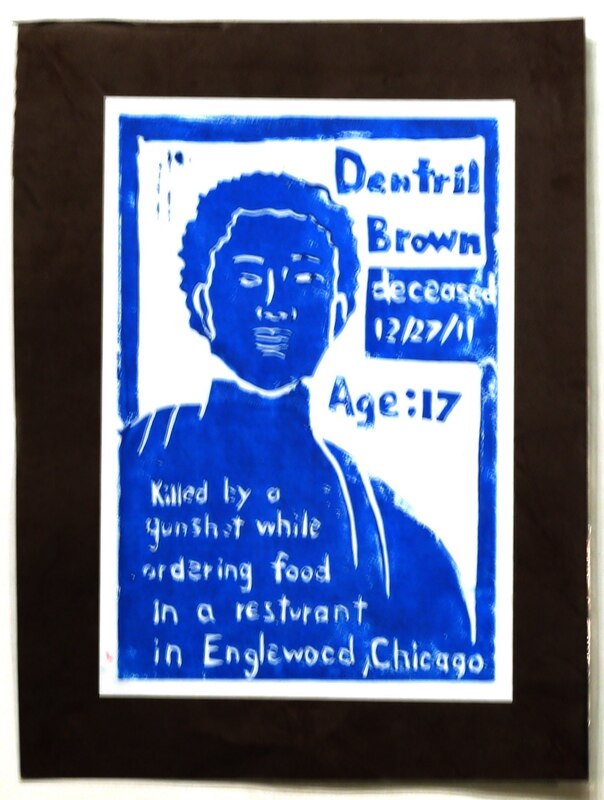 These prints, presented alongside works by noted Chicago artists, all respond to the horror of the continued youth violence in our community. Inspired by the play The Gospel of Lovingkindness, this exhibition aims to honor the memories of a generation too often lost in obscurity, to pay tribute to the lives, aspirations and dreams of children murdered in Chicago and call attention to the war that is taking place almost daily on Chicago’s streets. Uplift Community High School, along with most Chicago Public School students, are too often exposed to violence and trauma in their community and on the way to and from school. Starting in 2011, Uplift Art teacher Laura Mullkoff began to document the startling loss of life of young people in Chicago and debrief the trauma and fear that her students face on a regular basis. The Chicago Angels Project – The Forgotten: Chicago Youth Lost By Gun Violence (2011/13) memorializes over 250 young people from Chicago who lost their lives to violence in 2011 and 2013. 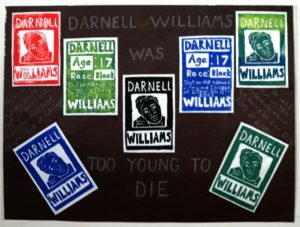 Each of Ms. Mullkoff’s students chose a young person who they may have known or not known, and represented who they were with text and image in a series of linoleum block prints. Over the last few years the prints have been displayed on the walls in the school, creating a mosaic like installation that has sparked a robust dialog amongst staff and students about the prevalence of violence in their community. In 2014 Mullkoff met Laurie Glenn of ThinkArt at the Victory Gardens production of The Gospel of Lovingkindness. They shared ideas and decided they both wanted to help continue the project on a larger scale. Thus, the Chicago Angels Project was formed. Glenn soon partnered with The Arts Palette and Josef Glimer Gallery, and they began organizing a formal exhibition with the student artist work combined with professional Chicago-based artists. A portion of all sales will be donated to the following non-profit organizations: Alternative Schools Network, CeaseFire, and the Illinois Council Against Handgun Violence. Our goal is to honor the memories of a generation too often lost in obscurity. Our hope is to bring their lives, aspirations and dreams to the forefront. Our wish is to call attention to the horror of the war that is taking place almost daily on the streets of Chicago.